Most people worry so much about their teeth that they forget about their gums. When gums are constantly overlooked and ignored, it can lead to disease and infection. The fact is that gum disease is the silent killer of teeth, leading to bad breath and tooth loss. Numerous studies provide evidence linking gum disease and other harmful conditions throughout the body. Some of these include heart disease, pancreatic cancer, diabetes, colon cancer and low birth weight in babies. More specifically, gum disease is a bacterial infection in the space between your teeth and gums. If left untreated this infection can get in the blood stream and cause systemic diseases like the ones listed above. Another unfortunate symptom of gum disease is bad breath. Depending upon the severity, treatment can be as simple as a professional cleaning or as complex as gum surgery. The first step is to diagnose the problem through x-rays. The result of the x-ray will also help us decide on a proper treatment plan. Gum disease is completely preventable through routine cleanings and checkups. Call us today to setup an appointment. Withering teeth or jaw pain after a restless night’s sleep can be a result of grinding your teeth — often unknowingly. Grinding is most often caused by stress, incorrect bite or skeletal problems. Just like sanding does to a wall, grinding wears down your tooth’s natural structure as well as cause painful fractures and expose sensitive nerves. Grinding can also cause you to develop chronic jaw pain known as TMJ (Temporomandibular Joint Disorder). We work with you to create a treatment plan that best fits your degree of damage. However, the most effective and convenient way to treat grinding is by wearing a night guard while you sleep. Night guards are made of an acrylic material that fits comfortably over the upper teeth. It helps protect your teeth from the forces of grinding and also keeps your jaw relaxed throughout the night. For more severe cases we recommend more extensive work such as root canals or crowns. Root canals can inspire fear with every mention, but in truth it is often the most effective way to reduce extreme tooth discomfort. Our specialty is providing a comfortable and pain-free experience through new techniques and personal care and attention. During the procedure, we remove the diseased tissue and leave the natural tooth intact. After the root canal is complete, patients generally report a dramatic decrease in pain. Truth: You are numbed prior to the procedure and don’t feel a thing. Myth: The roots are removed. Truth: The roots remain, and only the nerve inside the root is removed. Myth: Root canals result in a dead tooth. Truth: Even though the nerves are removed, the tooth is still alive and has living tissue around the outer part of the tooth. Myth: Root canals don’t last. Truth: Research indicates that over 90% last longer than 17 years. When a larger amount of tooth is missing, a porcelain onlay, or crown, is necessary to restore the tooth. Crowns encapsulate the damaged tooth and nerves to keep you from feeling pain or discomfort. We ensure that the crown is made specifically to fit your tooth in a dental lab under controlled conditions. Cavities come in all shapes and sizes. They are caused by bacteria which feed off food and sugar left on the teeth after eating. The bacteria produce acid that eats a hole in your tooth. The larger and deeper the cavity becomes, the harder and more complicated it is to restore the tooth to it’s natural strength and shape. If caught early, a simple filling can be done to restore the tooth. Sometimes a filling can be done without anesthesia (no shots) using a laser. If the cavity is not caught before it enters the nerve chamber, a root canal and crown may be necessary to restore the tooth. This is why regular visits to the dentist are necessary. Most cavities don’t hurt until they get deep into the tooth. You may be unaware there is a cavity. With regular dental checkups, including x-rays, we can catch them early. To treat a cavity Dr. Thornton will remove the decayed portion of the tooth and then “fill” the area on the tooth where the decayed material once lived. Fillings are also used to repair cracked or broken teeth and teeth that have been worn down from misuse (such as from nail-biting or tooth grinding ). Unlike the noticeable silver fillings of the past, we use only tooth colored resin filling material for all small fillings. This material is bonded to the tooth to create a long-term, natural looking filling. The shade/color of the composites can be closely matched to the color of existing teeth. This is particularly well suited for use in front teeth or visible parts of teeth. 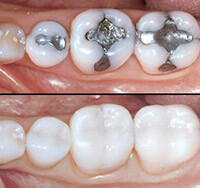 Traditional silver fillings replaced with tooth color fillings.